Spring weather seems to call us to the outdoors. We want to exercise our logy bodies, smell the warm earth, and gladden our hearts with the sight of newly unfolding wildflowers and the sounds of returning migrant birds. But where to walk? The Westford Conservation Trust has been working for 30 years to preserve some of Westford’s most beautiful open spaces and trails. 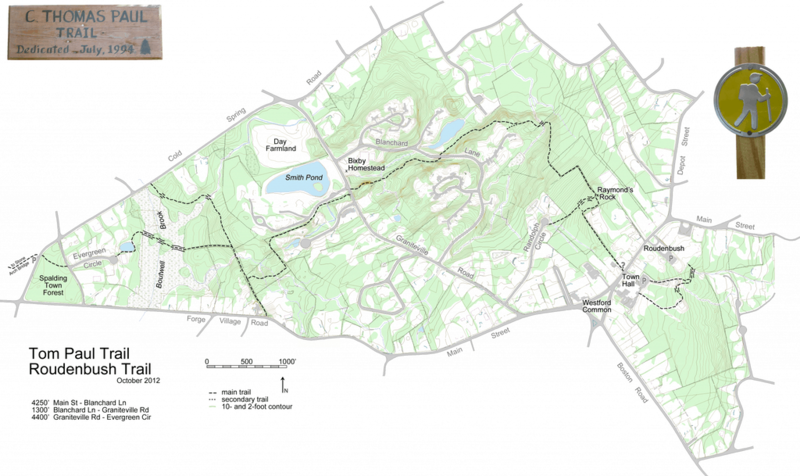 These lands and trails are open to the public and are maintained for the benefit of Westford’s inhabitants for passive recreation such as hiking, horseback riding, and cross-country skiing. The C. Thomas Paul trail, named in honor of the Trust’s President from 1988 to 1995, now a Connecticut resident, was marked and maintained for years by Tom and his children. The Tom Paul trail is one of the longest and most interesting trails in town, beginning at the center, and extending all the way to the Stone Arch Bridge in Graniteville. The trail includes a connection between Roudenbush and Town Hall and then continues at 56 Main Street directly across from the Town Hall, between a stone wall and a driveway. Look for yellow painted blazes to guide you. The trail from Town Hall to Pine Ridge Road is about 2 miles long, beyond which the trail extends another 3/4 mile through Town land to the Stone Arch Bridge. Much of the beautiful woodland through which the trail passes is permanently preserved open space belonging to Blanchard Farms, one of Westford’s most beautiful condominium developments. Please keep to the defined trail, which is a limit of the trail easement. The trail is hilly and at some spots, wet. The beginning part of the trail is a riot of wildflowers in the spring: Celandine, Wild Geranium, and Dame’s Rocket are but a few. As you make your way downhill, you will notice that you are passing between two stone walls which define an old colonial farm road. On the right and just before the two stone walls is “Raymond’s Rock”. Leaving the old road, another turn downhill will take you to one of the most beautiful areas of this trail. You will notice that the vegetation changes here to one of large pines and oaks, and especially Yellow Birch. The Yellow Birch is an unusual tree for Westford; notice its curly bark. Cross over a small stream on a footbridge, and if you are visiting in the month of May, you will be rewarded by the sight of a carpet of Pink Lady’s Slippers. This area of the trail is privately owned, so please respect the landowner’s generosity, and be careful not to disturb any vegetation. The trail proceeds past a small pond still within Blanchard Farms, crosses Blanchard Road, passes over a small earthen footbridge, proceeds uphill, in an area of very large rocks, and continues to Graniteville Road. To your right is the old Bixby homestead. David Bixby was a revolutionary war hero. The home’s owner after 1940 was Walter Blanchard, a W.W.I veteran and milk dealer. Cross Graniteville Road with a jog to the left of about 50 ft., and enter the trail again. This section of trail begins between two stone walls. A vernal pool (a pool which is wet only seasonally and which is utilized for breeding by several rare species of amphibians) forms in this area at times. Beyond the last house on Ledgewood Dr., the trail passes through a gap in an old stone wall, into a woodland, turns left along the wall, passes another vernal pool and crosses two streams. You will then find that you are entering another interesting old colonial road, defined by a pair of stone walls. Here the old road goes in both directions. The left leads to Forge Village Road. The route to the Stone Arch Bridge proceeds to the right. The road crosses an old colonial stone bridge over a brook, comes to an intersection and proceeds left along another old roadway bounded by a pair of stone walls. The Tom Paul trail turns left at this point. If beavers have rebuilt a dam across Boutwell Brook right where the trail crosses, you can continue straight (north), following a new trail, which was constructed to circumvent the beaver dam. It’s a beautiful walk, and leads to Cold Spring Road, at which point you will follow the road to the left (west), returning to the main trail after you cross Pine Ridge Road. A sign marks the place where the trail leaves Cold Spring Road. More likely, you can follow the original route and cross Boutwell Brook using a bog bridge recently reconstructed by Eagle Scout Charles Granger. In any case, the beaver dam is interesting to see. Before reaching the beaver dam, you will be on another historical road outlined by two stone walls. This road is shown on the 1730 Westford map, connecting what we now know as Cold Spring Road with Graniteville Road. The foundation of the old Paul Fletcher home is located here. Fletcher was a Westford farmer, tax collector and road surveyor in 1728. After the Boutwell Brook, the trail proceeds to Evergreen Circle. Keep the pond on your right, and walk straight across the cul-de-sac. The trail proceeds down the left-hand side of Evergreen Circle, though you may also walk along the paved surface. Beyond this point, the trail proceeds across Pine Ridge Road, straight through the Town Forest. It is very easy to see your way straight through to Cold Spring Road, opposite the trail head for the Stone Arch Bridge. Happy Trails!